As many of you who’ve previously used our services know what to expect, new customers are not in the loop! Let me start off by welcoming you. Here at Outdoor Designs, we strive to meet and exceed every one of your expectations. Please do not hesitate to reach out to us for whatever you might need. It is our first year offering a lawn care program, and we worked hard to get it done right. Luckily, our own family member has been practicing and honing his Turf Management skills in Augusta, Ga. He had previously worked at Target Golf here in Knoxville, TN, so we knew he was familiar with the area, but we needed to get him here. After a little bit of planning – we made it happen. Matt brought charisma, drive, and an advanced know how that we knew we wanted. So soon after arriving, he got to work. As many of you know, he probably called to let you know we were indeed offering this service, and he would be heading up the department. He also contacted many product distributors throughout the region to find the up and up in the industry. Having incorporated organics into his program in Augusta, GA, he knew the benefit would also apply here in Knoxville’s clay soils. He put together products from many different manufacturers to deliver the best end result possible. We know you’ll be pleased. Satellite photos do not show turf conditions. So you presently have a lawn, but how does it look? How is it performing? You simply cannot see this from current imagery. Cultural conditions. Perhaps there’s a patch of grass in the center of the lawn that’s performing better than everywhere else and is unexplained. Maybe it’s the only irrigation head that’s getting adequate coverage and thus allowing the turf to thrive. Outside forces. Sometimes there are small dead areas in the lawn that cannot be explained. No signs of insect activity, no signs of disease – yet a pitiful stand of turf. However, when probed, it turns out to be a rather large buried rock that’s obstructing root development and giving you the visual indicator of dead turf above ground. This cannot be seen from satellite. Meeting the customer. There is something special about putting a face with a name. Getting to discuss the ins and outs of the customers concerns and maintaining an open line of communication not only reinforces the customers’ importance, but also allows Matt to dial in directly and meet that customer’s expectation. Establishing rapport. Matt is a very nice guy, personable, too. That said, there are billions of nice people in this world. But why would you want Matt on your lawn vs. any other person? It won’t take long to find out. His knowledge will leave you feeling empowered. His honesty will leave you feeling confident, and his personality will leave you comfortable – comfortable your lawn and investment is in the best possible hands. After putting eyes on the yard, the standards come in to play: A measurement is taken to calculate square footage, a plan for what the lawn needs to improve is devised, and approximate dates are penciled in to get it done. Hey Customers of Outdoor Designs! I’m Matthew Martin. 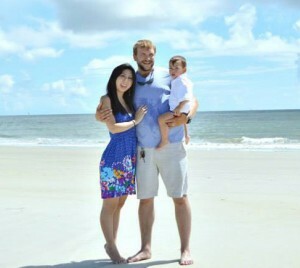 I was born in Mississippi, raised in Memphis, TN, lived and worked here in Knoxville, TN and Augusta, GA.
My wife Asami, and my son Noah, and myself would like to thank each and every one of you for the opportunity to assist, serve, and all around make your lawn a better place to spend more time. If there is anything at all you ever need, no matter big or small, do not hesitate to contact me – that is what I’m here for. There is no longer a need to worry, you’ve got a lawn guy.